2 January 2011. Feeling tiny, I prostrated before the enormous form of Pandavadhut, the deity of Lord Krishna commemorating his role as the messenger of the Pandavas. Situated in Kanchipuram in South India, the deity is twenty two feet tall, his other dimensions proportionately set. He is visibly almighty, as the scriptures describe him—and seems perfectly capable of fulfilling all desires. Gazing up at him, struck by awe, I wondered what prayers he received from the pilgrims. Perhaps those seeking sensual pleasures prayed for success in endeavors, money or fame. Perhaps those in distress prayed for relief from trials and tribulations. And perhaps the enlightened prayed for ultimate liberation from repeated birth and death. But I couldn’t fathom the thoughts of those beyond even enlightenment, of those who actually loved God. Radhananth Swami is really different person. Maharaj is inconcievable, when it comes to Love for the Godhead. Sometimes it feels that Maharaj is reading the mind of the person who is thinking about something. We can not predict the answers which Mahhotraj can give. 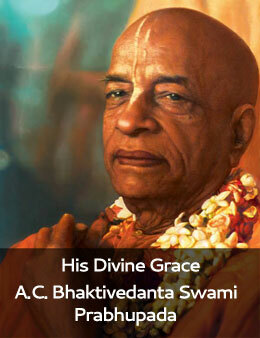 The speciality of Radhanath Swami is that(definitely inspired by Paramatma situated in everyone’s heart) the very purpose he speaks is to pacify the minds of people who are bewildered with the things or places or people one experiences or comes across in one’s lifetime… This has been true in many of the interactions we have heard about him. Prayers to Lord Pandavadhut to give me His Prema Bhakti unto Hist Lotus Feet. Maharaj is transcendentally situated at all times.Thanks for sharing. Praying to become servant of servant of servant is what mood Radhanath Swami teaches us through the life of previous great spiritual teachers. Any material benediction will be anyways swapped away by time. What a realization by Radhanath Swami….just amazing. We cannot even imagine his love for Krishna! Hare Krishna. Thank you for sharing Maharaj’s realization. This is truly touching. Thank you for sending this post. You can never understand how Radhanath Swami can completely uproot you ! Maharaj is a personification of devotion and love for Krishna ! Radhanath Swami Maharaj gives a totally different perspective to everything!